Large and bright, elegantly decorated, our Elegance room on the first floor reached by the lift, looks to the little square of Orta from the ancient wisteria-woven balcony. Featuring a double bed and a contemporary-style bathroom with hydromassage shower, this air-conditioned room has a large corner spa bath in front of the bed, providing deep relaxation and well-being. The ceramic floor completes the decor of this romantic room with atmospheric lighting, with stone walls, a wooden ceiling and cute, contemporary-style decor. On request it is possible to add a third bed or cot. The wi-fi is available free of charge in the entire structure, starting from all the common areas, to understand the courtyard and the living room on the terrace, however the historical character of the buildings with very thick walls motivates the fact that sometimes the connection room is interrupted. . Free wired internet is available from the rooms. Spacious and welcoming, finely decorated, our Elegance room on the second floor reached by the elevator, offers a view of the square below and peeks the lake from the ancient twisted wisteria balcony. Featuring a double bed and a contemporary-style bathroom with hydromassage shower, this room also offers excellent climate control and, next to the French windows with white curtains leading to the wrought-iron balcony, a large corner whirlpool tub, ready to pamper you after a visit to the beauties of the place. The ceramic floor completes the decor of this romantic room with atmospheric lighting, stone walls, wooden ceiling and cute contemporary-style decor, making it an ideal choice for discerning travelers. On request, it is possible to add a third bed or cot. The wi-fi is available free of charge in the whole structure, starting from all the common areas, to understand the courtyard and the living room in the terrace, however the historical character of the building with very thick walls motivates the fact that sometimes the connection room is interrupted. . Free wired internet is available from the rooms. Spacious and welcoming, tastefully decorated, our Elegance room on the third floor reached by the elevator, is a real mini apartment that offers a breathtaking view of the Island of San Giulio. Equipped with a spacious balcony with a very special double whirlpool bath, it is perfect for enjoying moments of spectacular relaxation and well-being. The double bed and bathroom in contemporary style with shower complete this room with excellent air conditioning and, by opening the appropriate sliding doors, a beautiful foldaway kitchen, and a minibar. The ceramic floor completes the decor of this room at the same time practical and romantic, with its atmospheric lights and cute colored decor painted in contemporary style, an ideal choice for the honeymoon or first night after the wedding on Lake Orta . On request, a cot can be added. The wi-fi is available free of charge in the whole structure, starting from all the common areas, to understand the courtyard and the living room in the terrace, however the historical character of the building with very thick walls motivates the fact that sometimes the connection room is interrupted. . Free wired internet is available from the rooms. 1) The Management declines all responsibility for money and / or objects of the Customer Lords not delivered for safekeeping in the safe of the structure. 2) Guests arriving can check-in between 14:00 and 20:00. If you arrive after 8 pm, please notify us by e-mail, writing to info@locandaorta.com or calling +39 0322 905188. 3) Guests departing are asked to vacate the room by 11 am not to incur supplements or even the full price of the room. We will be happy to store your luggage until you leave. 4) The Customers who, for any reason, anticipate the departure date established in the reservation and confirm, are required to pay the total stay booked. 5) Breakfast is served from 9.00 to 10.30.
) Small dogs are welcome at Locanda di Orta, free of charge. 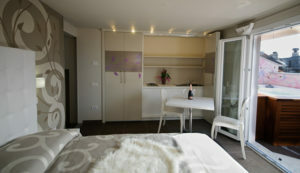 8) In the rooms where you can add a cot or extra bed, the costs are € 15 and € 30 per night respectively. 9) The city tax of Orta San Giulio is € 0.50 per person, per night.